With north to the left, this map shows 170 miles (275 km) of the western coast of Italy from La Spezia to Civitavecchia, with the promontories of Piombino and Monte Argentario heavily shaded. 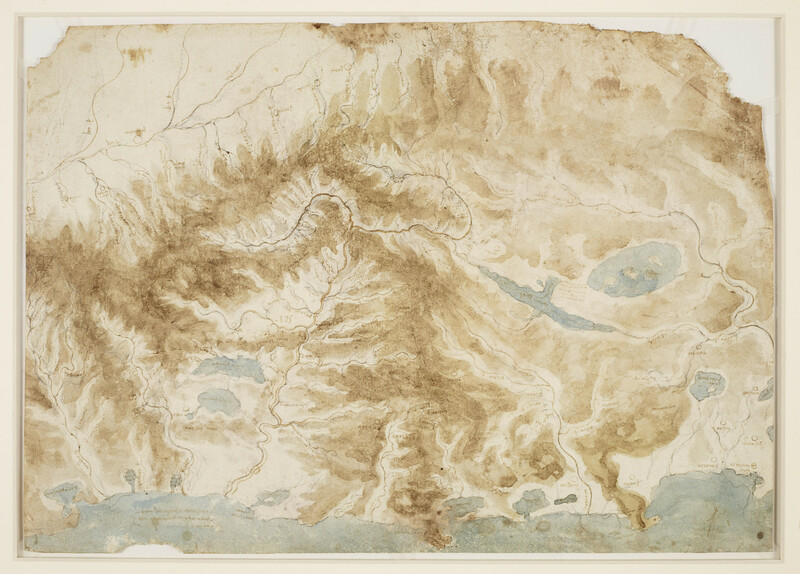 The focus of attention is the Arno valley; the lakes of Valdichiana and Trasimeno (see 89) and the upper Tiber occupy the right side of the sheet, and the Po is roughly sketched at upper left, though it flows in the wrong direction. Leonardo’s drawing is based on a map of c.1470, now in the Vatican but then in the ducal library in Urbino, a city visited during his surveying work for Cesare Borgia in 1502. Leonardo transformed his model with the use of relief shading, and added much detail in the upper Arno and its principal tributary the Sieve, where mere streams and villages are included. This map was relevant to several of Leonardo’s projects in military and civil engineering in the years around 1502–4, but more generally reflects his long interest in the habits of rivers. It is likely that he made it for his own reference as a summary of all his available knowledge on the topography of central Italy. Melzi's 175.